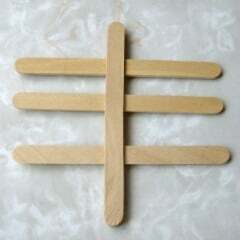 Things You Will Need: 5 Popsicle sticks, craft glue. 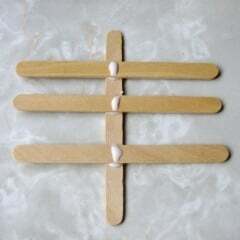 Step 1: Take one stick a lay it vertically on a flat surface. 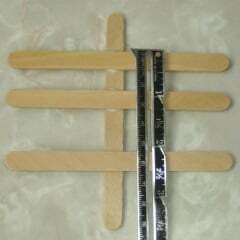 Step 2: Take the second stick and glue it in the center about 1 inch from the top of the first stick. 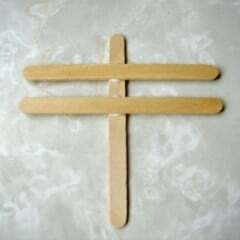 Step 3: Take the third stick and glue it about 1 cm below the first stick. Step 4: Decide how long you want the tassels to be, then measure and glue the fourth stick in the desired place below the third. For example, if you want the tassels to measure 2.5 inches long you would measure 2.5 inches from the top of the top stick to the bottom of the bottom stick. 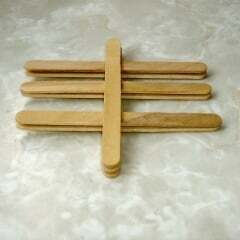 Step 5: Dab some glue on the center of each horizontal stick and glue the last stick vertically over the horizontal sticks so that it lines up with the first stick. 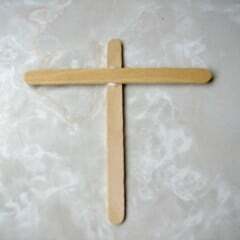 Wipe off any excess glue around the outside edges. Press down firmly for a minute or so until the glue sets in. Optional: For extra strength and easier cutting repeat steps 2-5 placing each stick directly over previous sticks. Here are step-by-step instructions on how to make tassels.